Quite a feat: CNN has pulled off the MSM equivalent of describing a spiral staircase without using one's hands. It has managed to produce a segment on "honor killings" and related violence in the UK . . . without using the word "Muslim" or "Islam." CNN Newsroom anchor Don Lemon introduced the segment this afternoon at 1:37 PM EDT. DON LEMON: Women forced into marriages, or killed for having the wrong boyfriend. So-called "honor crimes" are often committed by fathers or brothers when daughters do something that supposedly brings shame on the family. It's on the rise in Britain, and authorities, they are very worried about it. Our Paula Newton reports. 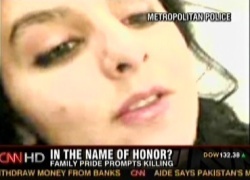 Honor crimes are "often committed" by father and brothers? And the crimes are "on the rise" in Britain? Now why would that be? Newton did little to elucidate. She told the story of Banaz Mahmod [seen here]: kidnapped, tortured, raped and murdered at the order of her father, Mahmod Mahmod, for "bringing shame" on her family. Newton never mentioned that Mahmod was a Muslim, an Iraqi Kurd. According to Diana Nammi with the London-based Iranian and Kurdish Women's Rights Organization, "we're seeing an increase around the world, due in part to the rise in Islamic fundamentalism." Instead of identifying the root of the problem, Newton said only that British authorities have instituted public awareness campaigns in "the few communities" where they've seen problems. She cited a figure of 17,000 honor crimes or forced marriages as possibly being only the tip of the iceberg in the UK. A British police official is then seen decrying the fact that "the perceived honor of the family is seen as more important than the life of a child." In which families? The policeman never said and CNN never explained. The closest the segment came to revealing the truth of the matter was during an interview with a woman living in hiding for fear of her life for having converted to Christianity and refused an arranged marriage. She mentions that her family has justified killing her for her failure to obey Koran and Allah. And at another point in the segment, brief images of women in black burquas appear. But the words "Muslim" or "Islam" are never heard during the segment. Newton again elliptically speaks only of "communities" where "young women still live in fear." Which communities might those be? CNN doesn't say. The network deserves some credit, I suppose, for airing the subject at all. But CNN's failure to mention by name the religion that lies at the root of the problem constitutes a particularly craven political correctness.